In Professor Valerie Joyce’s visits to schools, she asks students to name African-American women they know of from before 1865. Even among black female students, the responses quickly falter – Harriet Tubman, Sojourner Truth, maybe Sally Hemings. With 250 years of history in the United States before the Civil War, this whole segment of our population is virtually silent, unknown. Through academic research, Joyce unearthed 15 mostly obscure black females in historical documents from colonial times through Emancipation. She has given them voice with imagined monologues in her heart rending play I Will Speak for Myself. For some of her characters, there is scant evidence of their existence. Abigail, a Negress, is known by that designation from the sole record of her existence – her listing among the dead from a yellow fever epidemic in Philadelphia in 1793. At the other extreme, Elizabeth Keckley flourished as First Lady Mary Todd Lincoln’s personal modiste. Keckley’s life was chronicled in her illuminating autobiography Behind the Scenes: Or, Thirty Years a Slave and Four Years in the White House (1868), which also revealed intimate details about the First Family. Although the stories of these women could be told by up to 15 performers in cameo roles, this original format, which has played from Off-Broadway to the Edinburgh (Scotland) Fringe Festival, is a one-woman show starring Kimberly S. Fairbanks. Joyce confidently enlisted her former Villanova University graduate student to realize each of these women. The characters are endowed with realistic and sometimes chilling soliloquies concerning some event in their lives. On a nearly barren stage, with only the occasional change of hats or shawls to distinguish each woman, Fairbanks brilliantly enters their bodies and souls. They vary from barely pubescent to geriatric; from strong to frail; from eloquent to illiterate; from freed New Englander to southern slave. By varying accent, tempo, clarity, volume, pitch, and more, Fairbanks creates a unique sound for each one. Movement and facial expression, from supreme confidence to cowering, add to the overall rich characterizations. Most of the women shared the common bond of experiencing slavery, but their paths diverged. The 15 include a preacher, an actress, a seamstress, poets, social reformers, and a side-show “curiosity” with P T Barnum’s circus. Each had a touching story. The most common themes involved denigration and degradation. The earliest story was of Mary from 1649. Convicted and penalized for fornicating with a white man, it was painfully clear that she was first victimized by the white man and then with the punishment as well. This was the sad but common fate of a slave. One of the saddest stories was of Lucinda in 1813. In the 21st century, we find the idea of being enslaved so heinous that we can’t imagine an instance in which anyone would accept slavery over freedom. Though granted her release from slavery, Virginia law would not allow Lucinda to stay in the state as a free black woman. Because of her love for her husband who remained a slave, she requested to be returned to slavery to be with him. Interestingly, last year, Marin Shakes premiered “Thomas and Sally” about Jefferson and his slave mistress Sally Hemings. Sally and her brother both had the “opportunity” to flee slavery when they were serving the master in France but chose not to because they feared the consequences and failed to see how they would have the chance to live free. It was unfortunate that the cost of escaping slavery could be so unbearable. I Will Speak for Myself is a powerful experience. Seldom told stories are supported by a scintillating performance. It is not possible to see it in this current incarnation, as it ran only one weekend at Eugene O’Neill’s Tao House, a National Park Service property of interest in its own right. Sometimes venues contribute to the overall experience of art. Carnegie Hall is flush with memories of all the great musicians who have performed there. The edifice of the Guggenheim Museum at Bilbao is its own greatest piece of art. On a smaller scale, Tao House is a destination that theater lovers in the Bay Area should enjoy, whether to see a play or simply to visit the park. The ghost of O’Neill stalks the grounds and the visitor can see his study where the playwright’s fertile output included his masterpieces Long Day’s Journey into Night and The Iceman Cometh. 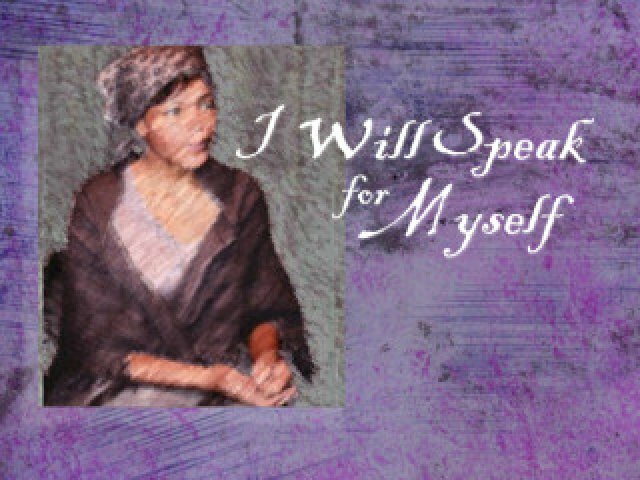 I Will Speak for Myself written by Valerie Joyce was produced by Pastime Productions and played at the Old Barn at Eugene O’Neill’s Tao House, 1000 Kuss Road, Danville, CA July 7-8, 2018. "Victor.... Nice review. Well written. If you and Karin went to Spring Green let know. Are we still on for lunch at Sherman's on August 21st?"